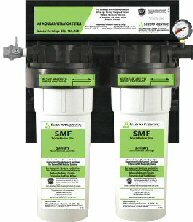 Why Choose Selecto Water Filters from ezClearWater.com for Your Family? The Right Choice to Keep You Healthy! Standards 42 for both chlorine and chloramine and much more! Standard 53 for cysts & VOCs including carcinogenic chlorination byproducts & more. 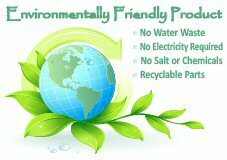 Commercial Quality Filtration for Your Home! All for less than a penny per gallon! Why You Need a Whole House Filter? Why Choose a Filter made by Selecto, Inc? When it comes to Water Purification Systems, One Size DOES NOT Fit All. We give you the information you need to make the smart choice, and if you need help, just give us a call! No pushy salesmen - just information. Never use any brand of Water Filter far beyond 12 Months without changing the cartridge. Bacteria will grow inside the cartridge and make your water unsafe. Our Hollow Carbon media prevents bacterial growth for at least a year. First: Is your water disinfected with Chlorine? or Chloramine (also known as Combined Chlorine - a combination of 80% Chlorine and 20% Ammonia)? If you don't know, call your water department and ask or look up your Water Quality Report. (They are usually online.) The answer is important because chloramine uses up any brand of filtration media far more rapidly than does chlorine. This fact very much affects which size filter is right for your needs. Option: Reduce Fluoride in your Whole House! The Perfect Fast, Easy Do-It-Yourself Installation Filters! Easy & Simple installation with no electricity or backwashing required! IMPORTANT: Most whole house filters ONLY reduce sediment and chlorine. 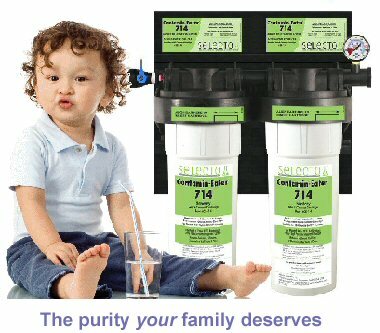 The Contamin-Eater removes the carcinogenic chlorination byproducts and other chemicals that harm your health, plumbing,& appliances. Unlike KDF, our Hollow Carbon removes BOTH chlorine and Chloramine. Customer Service in the USA! Contamin-Eater Residential series is the counterpart to the SMF IC series. Standard 53 for Health: Cysts: (Cryptosporidium, Giardia, Entamoeba, and Toxoplasma), MTBE, *VOCs including (T)THMs, Organics, Tannins. Healthy Living Means Using a Whole House Water Filter! According to a new report by the cancer panel: “Only a few hundred of the more than 80,000 chemicals in use in the United States have been tested for safety. Many known or suspected carcinogens are completely unregulated.” Removing chlorine makes your water taste better, but does nothing to protect you from the real dangers to your health - chlorination and chloramination byproducts. That's why The Contamin-Eater is your best choice! Filtering the water coming into your house makes your water heater and other water-using appliances last up to 50% longer, especially if your water is disinfected with Chloramine, which corrodes rubber gaskets and even stainless steel! Removing chemicals from your bath and shower makes your skin and hair softer and healthier and prevents you from inhaling toxic gasses and absorbing them through your skin. Water Softeners/Conditioners DO NOT remove most dangerous contaminants. KDF 55 Media DOES NOT remove Chloramine. EVERY CARTRIDGE FITS EVERY FILTER HEAD! What does Modular Construction mean for You? First, Modular Construction means faster, easier initial installation, saving you time and money. Installation is usually only $130-$350 plus fittings, though many people can do it themselves. Second, Modular Construction means your needs can change without having to buy a new Whole House Water Filter! Did the kids move back in and you need a higher flow rate? Just add another filter to the system you already have! Did your cartridge last less than a year? Simply purchase a longer cartridge the next time. Did you decide you want the fluoride out of your water after all? Any double cartridge water filter can have Selecto's ABA2000 media added to reduce fluoride (though a little reconfiguration is necessary). Selecto offers singe or double head filters with 10", 14" and 20" Filter Cartridges, as well as triple filter systems, so we can scale a system to meet YOUR needs! 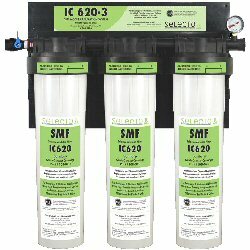 Is the manufacturer of the filter listed with the NSF HERE? And is the FILTER tested to the standards set by the NSF to perform for the duration claimed and to remove the contaminants claimed? Many filters on the market use MEDIA (example: carbon block) that is certified for use in water filtration to remove certain contaminants. That alone gives you absolutely no idea how much of that media is in the filter and how long or how well the filter will perform. Does the other filter you're considering require a pre-filter? If so, how often do you have to replace the pre-filter cartridge, requiring extra time and money? Rarely do our customers need a Pre-Filter. Can you replace the cartridge without tools or backwashing? Or is replacement an ordeal? With our Sanitary Quick Change Cartridge, replace ours in just a couple of minutes with NO TOOLS NECESSARY! What needs replacing? Do you change cartridges? Or do you have to mess with toxin-filled media? Our Sanitary Quick Change Cartridges do not expose you to accumulated toxins. Does the filter remove more than Chlorine and/or sediment? What about Chloramine? Cysts? Total Organic Compounds? Tannins? Trihalomethanes (THMs or TTHMs)? VOCs? Most Whole House Water Filters are only tested or certified for Standard 42: Chlorine & sediment if actually tested at all. Their "Capacity" (number of gallons filtered) only applies if your water is disinfected with simple chlorine. Does the filter use old-fashioned, less effective carbon block? Coconut shell? Our Patented Hollow Carbon media absorbs 30 times more Chloramine than traditional carbon block! Do they claim a 3-10 year capacity? No filter can stay sanitary for that long! Absolutely none. It's best to size your filter to about a year to fifteen months of use before cartridge change, and have filtration media that kills bacteria for that long. We do. Years of using the same cartridge/media will guarantee you have a "bacteria farm" for your water to run through before it reaches you! Made in the USA No boat loads from China. No child labor. No cheap components! Your Contamin-Eater Whole House Water Filter will be built for you in the USA. Each component is inspected and assembled by hand by skilled technicians who care about your Water Quality and Product Satisfaction. We stock all the Whole House Water Filter systems and ship the same or next day, but sometimes due to high volume we run out before our next reorder comes in. If this happens, please allow up to 2 weeks production time plus delivery time (though it usually arrives much faster!. The rare wait will be worth it! If you need help choosing, try our "Choosing the Right Filter" page, call us (770-532-4743 or 678-936-1274) for help, or email your information. We love talking with you! ezClearWater.com is the Authorized Residential Distributor for Selecto. Our Happy Customers are our Greatest Asset! For your awareness, these websites are affiliated with or owned and managed by the companies listed below. © 2007-2013 ezClear Water. All rights reserved.